Looking back at director Damien Chazelle’s back catalogue, debut feature Guy and Madeline on a Park bench, his script for Grand Piano, and the film that made his name, Whiplash, it’s clear to see that his tastes in movies veer towards the musical. His latest feature, the seemingly unstoppable award winning juggernaut La La Land, sees all those loves and influences come to a head in an old school throwback that pays loving homage to an age of cinema where bright colours and the cast regularly burst into song. But does this romantic musical comedy/drama deserve the universal acclaim and record setting seven Golden Globe awards? Short answer: yes. A hundred times yes. 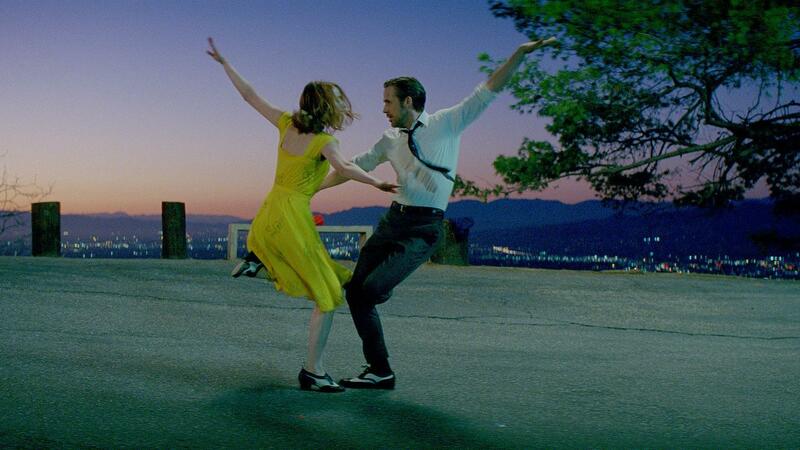 Set in a Los Angeles (as much a character as the two leads) where the golden age of Hollywood bumps against the modern day, La La Land wastes no time in letting the audience know what they are in for with a rousing dance number that kicks things into high gear quickly. From there, we meet Sebastian (Ryan Gosling), a Jazz musician whose career has stalled thanks to his traditionalism, and Mia (Emma Stone), an aspiring actress, who after a few stops and starts begin a relationship while both trying to fulfil their dreams. It’s a pretty standard story, but Chazelle (working from his own script) makes it his own, effortlessly balancing a healthy dose of realism and genuine romance with the style and tone of classic musicals. Only the coldest heart will fail to instantly feel for these crazy kids and their sweet, yet rocky, relationship, brought to life with ease by Gosling and Stone. Marking the third time they have shared a screen (after Crazy, Stupid, Love and Gangster Squad), their chemistry is undeniable, and one of the movie’s many highlights is seeing the two spark off each other, both verbally and musically. While they both go above and beyond in their roles, Stone just edges out her co-star, imbuing Mia with such an endearing sweetness that the audience will be falling for her alongside Sebastien. The pair both hold their when it comes to the singing and the dancing, ably helped by Chazelle’s eye for what made the enduring genre so beloved, the fact that they have little to no background musical background making it all the more impressive. The entire movie is a gigantic pop of colour, with vibrant shades of blue, yellow, and green fighting for space at any given moment, and all the musical numbers are shot in one take, echoing the old school style. These often dream like interludes won’t fail to put a smile on your face (especially a sequence that goes from an apartment building to a pool party and eventually into the pool seamlessly), shot through with an infectious energy that will have your toes tapping almost independently from the rest of your body. Shot through with a clear passion for it’s influences, La La Land is nothing short of a masterpiece. Pure and simple.